it’s mildly inappropriate to belt rap songs while in the car with your parents | you seem nice. so, there we were. just finished family dinner and were on our way back home. next thing i know, i’m screeching along to bed rock by young money. the “call me mr. flintstone, i can make your bed rock” part in particular. that’s when i made the realization “…this is kinda awkward.” luckily, no one seemed to care. they just wanted me to shut up. i also call the “featured picture” the sound of music shot. i think it works. anywho, by now i’m assuming everyone is finished with the semester. to which i say, GOOD JOB, you did itt! a few things have happened since the last post. for starters, i witnessed some students become alumni to good ol’ st. ed’s. it was kinda surreal. but i congratulate ALL recent grads, even you j.nan! i also got a new phone. say whaaa? you see, my old phone’s speaker decided to stop working. so sometimes when i called someone i would know that someone/something picked up but i didn’t know if it was a person on the other line, or no one at all and i was screaming “i can’t hear you…i don’t know if you can hear me, but i’m gonna hang up and try again. i hope this isn’t a message!” to their voicemail. lots of fun. and by fun i mean it wasn’t, it was awful. it would also fail to work when someone called and i answered and heard crickets on the other line. basically, it was super annoying and frustrating. so after a brief stint with one of david’s old phones, a trip to the phone store and the phone salesperson asking if i knew how to drive, i got a new phone. it’s an iphone. yes, i know i sold my soul, became a sellout, blah blah blah. whatever! i like it a lot, so i don’t care. it was between the iphone and a blackberry torch. i decided i didn’t want another slider phone because of my tendency to play with it so. yeah. early christmas gift to the girl that CAN drive. by the way, i’m horrible at angry birds. horrible. i’m horrible at every game, but for some reason, this one takes the cake. i’m pretty sure it has to do with the fact that it involves angles. and what do angles equal? math. problem? (no math pun intended) yes, yes it is. on to less yet more fascinating things. yesterday, i wrapped a crapload of the pint-sized punk and tiny terror’s christmas presents for 4 hours. the largest thing was some crazy star wars thing. it was seriously huge. i didn't remember the name of the toy so i left a post-it note for my aunt that read: behemoth star wars elephant-like machine"
obviously, i couldn’t get past the -aps. but whatevs. i can rewrite it TOMORROW. because i’m wrapping presents all day for my grandma. i’ve been helping her wrap for like 5 years. except last year she suckered me into baking the christmas cookies she usually makes. so i’ll most likely be wrapping during the day and baking later that night. but whatevs. it’s fun…most of the time. i also made the realization earlier that this is the family traditions part of the year. wrapping presents, baking goods, and making tamales. stereotypical? of course. do you think my family cares? we have a freakin chihuahua (not my choice). so, no. don’t care. the tamale making experience is semi-ridiculous. on my mom’s side everyone forms an assembly line in the garage. my grandma puts everyone to work. there’s no such thing as being “too young.” if you’re under 6 you’re part of the taste testing team with the uncles who have a dual role as taste testing working line. they take no prisoners. anyway. i’ll take some pics and float em around the internets. keeping with the festive tradition, on to the 11th week of christmas! and oh mah itty bitty baby jesus, christmas is next week! so. crazy. hopefully everyone isn’t runnin around like mad men/women trying to find gifts, freakin out about not knowing what to get or on the verge of having a meltdown trying to remember where they parked their car in the parking lot. it will all work out. because it has to. so don’t worry! just go with it! I loves me some wrapping presents! 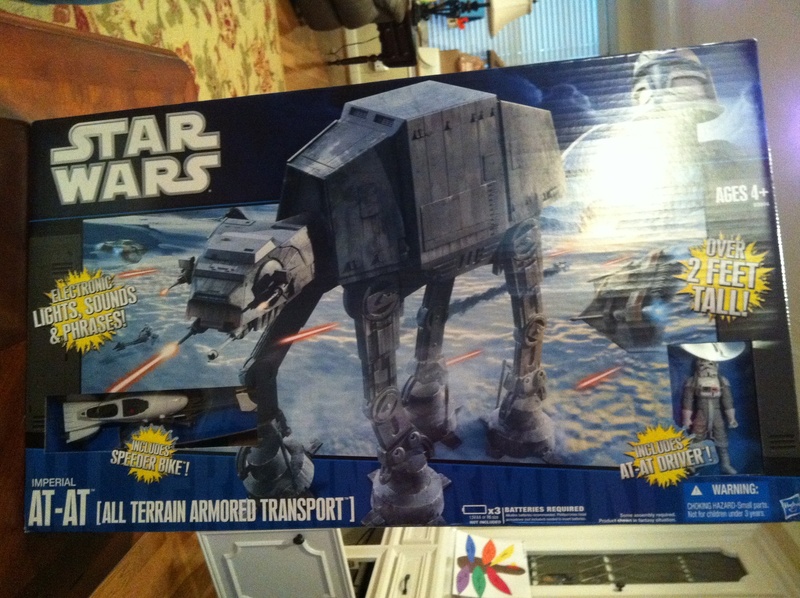 Seriously though, if you didn’t /slash/ don’t know waht the AT-AT is….you have some SERIOUS problems. hahahahahahaha i’m sorry! i can’t help it! You forgot to mention who you stayed with AND the awesome where’s Waldo game we played graduation style!! ooh snap…don’t worry i updated it!